At the time of publication, all recipes were free of the allergens listed as being free of in the title (i.e. soy-free, milk-free, etc. ), and all other information shared was accurate to the best of my knowledge. Though I strive to update outdated information quickly and work diligently to make sure you have the most accurate information possible at all times, it is your duty to double check labels EVERY TIME to ensure that the ingredients you use are SAFE FOR YOU. DO NOT RELY SOLELY ON THIS INFORMATION AS INGREDIENTS AND INFORMATION DO CHANGE. Your doctor or allergist should also be your first go-to for information on how to handle your medical needs. That being said, if you DO notice an error, please send me an email letting me know (tell me what page or recipe the error is on, what the error is, etc. ), and I will correct the error ASAP. Thank you so much! Please Be Advised:I make sure all of my recipes use foods that are free of the allergens they say they are free of. You will need to do the same. For help with this, please see the appropriate "Alternative Names" page for the allergen(s) you need the recipe free of. 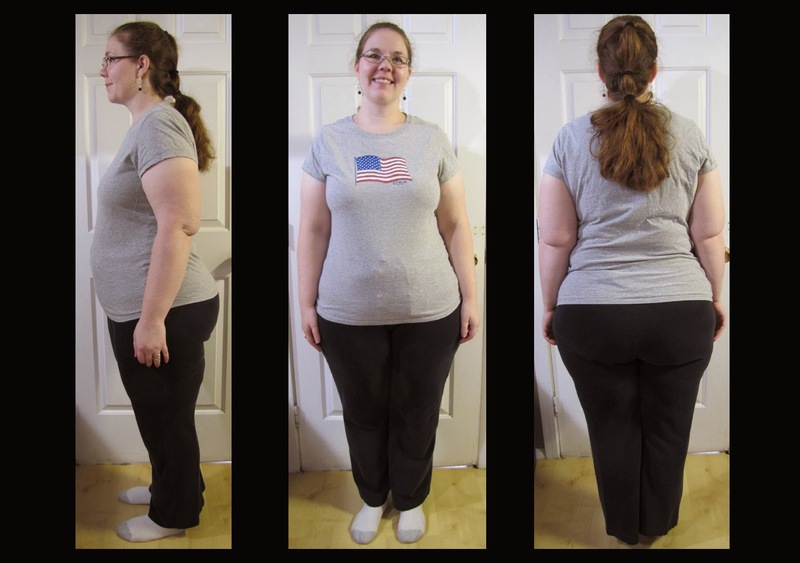 Me today, December 6, 2014, at 230.5 lbs. I've gained a little. Much to my chagrin, my weight has gone up again. 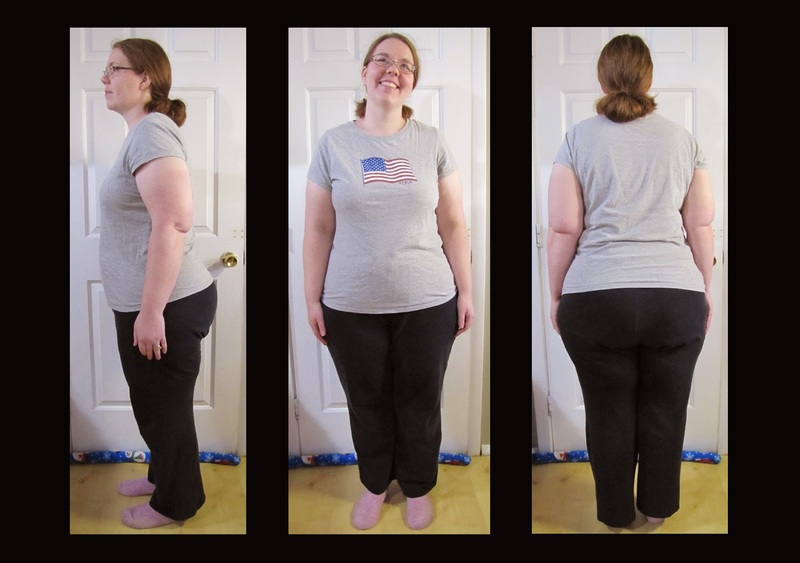 I've technically only gained 0.7 lbs., but I round to the nearest 1/2 lb., so my 230.4 lbs. is rounded to 230.5 lbs. Anyway, I could blame my weight gain on a lot of things outside my control, but I won't do that. I know I've not been sleeping as well, I know we've eaten more "quick and convenient" meals vs. healthy ones, and there's been a lot of stress. I know that it doesn't matter how crazy life gets, I have to eat right and make sure I get some form of exercise or I pay for it later, and I just haven't been diligent about that this last month. 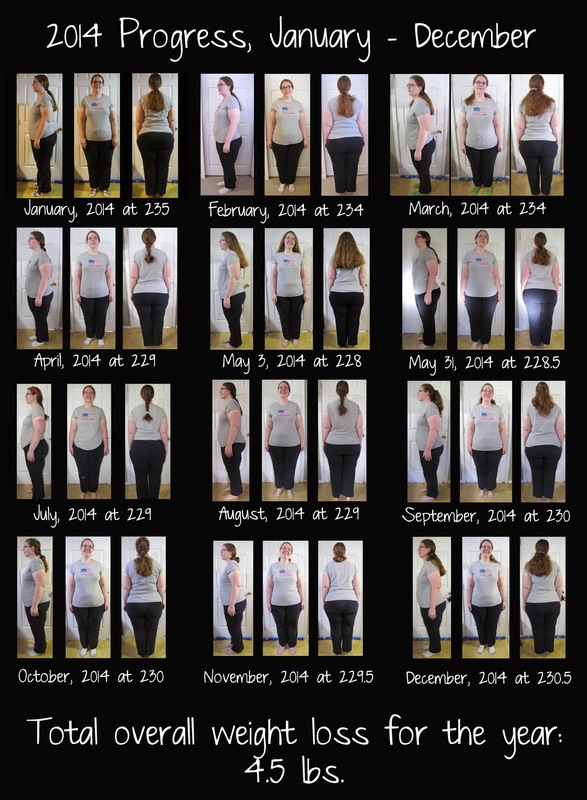 Not only has this lack of taking true care of myself shown in a weight gain, it shows in the amount of pain I've been facing, trouble sleeping, IBS symptoms, etc. I will definitely be working more on taking care of me, even when life gets nuts, because I have to. I am still trying to walk daily, at least during the week days. On preschool days (Monday - Thursday), I get about 20 minutes of walking in. I try my best to do at least one chore per day that requires more effort (i.e. vacuuming/sweeping, laundry (all parts of that), scrubbing the bathroom, shoveling snow). It doesn't always happen, but it's a goal of mine. I also try to get a walk in when it's not too cold on non-preschool days. Again, that doesn't always happen, but it is a goal. Physically, I'm not at my best. You can read more about this here. I pretty much just feel "off" most of the time, and have been dealing with more pain (in my breasts and my back and in relation to headaches/migraines), general fatigue (sometimes overwhelming) and still having that weird swallowing thing when I have a lot of phlegm especially (like right now since I think I'm starting to get a cold or something). My brother and his wife just sent me a book to read that may help with all of this (Thanks again, John and Patty! Love you!). We shall see! Prayers appreciated. It can get really hard to stay positive and upbeat, especially when all the tests have come back "within normal" but they agree that something is going on, they just can't find it. Thanks so much! I know 4.5 lbs. isn't a ton, but it's something! :) I'll take it, and hope that next year it will be at least double that. We shall see! I want to thank all of you who have supported me along the way. Your support has meant so much more than you know. The days I felt like giving up, I'd think of all of you out there cheering me on and praying for me, and it made all the difference. Thank you so much for being there! Now, onto some of my Thanksgiving favorites. Though most of us associate Thanksgiving with turkey (and I do, too), I decided to forego that obvious entry and focus mainly on sides and desserts. I am not going to get into the "left overs" category either, but you can feel free to link-up some of those, if you wish. :) Anyway, I will be sharing my favorites in a few categories: Traditional Thanksgiving Sides (Made Allergy-Friendly), Alternative Thanksgiving Sides, Traditional Thanksgiving Desserts (Made Allergy-Friendly), and Alternative Thanksgiving Desserts. Here we go! This is one of my favorite sides ever. No Thanksgiving would be complete without green bean casserole in my book. This recipe is very good and can even be made with other veggies (like broccoli) instead of green beans, if you desire. If you're looking for something a bit different, but still in season, this great salad fits the bill perfectly! It has your sweet and crunchy and a little bit of tart, too. It's one of my favorite salads to date! These could be either dessert or side, but 100% delicious either way! They are a favorite anywhere I take them. If you love pumpkin cake, pumpkin bread or pumpkin-flavored things, you will adore these! This is, by far, my favorite traditional Thanksgiving pie ever. The recipe listed is not super allergy-friendly, however, you can use the ingredient substitutions page to find ways to make it more allergy-friendly if you need it to be. You can use gluten-free crust if you need it to be gluten-free. You can use dairy-free butter and my simple pie crust recipe if you need it to be dairy-free. The only thing you'd not be able to make it is probably egg and nut-free. You could use another type of nut, though, such as walnut or almond, if you could have those and not pecans. I honestly am not a fan of pumpkin pie. Never have been. However, this I like. It tastes very similar to pumpkin pie without the crust. It is a great alternative for those who want the flavor of pumpkin pie in a more allergy-friendly form. 55 Ho, every one that thirsteth, come ye to the waters, and he that hath no money; come ye, buy, and eat; yea, come, buy wine and milk without money and without price. 2 Wherefore do ye spend money for that which is not bread? and your labour for that which satisfieth not? hearken diligently unto me, and eat ye that which is good, and let your soul delight itself in fatness. 3 Incline your ear, and come unto me: hear, and your soul shall live; and I will make an everlasting covenant with you, even the sure mercies of David. 4 Behold, I have given him for a witness to the people, a leader and commander to the people. 5 Behold, thou shalt call a nation that thou knowest not, and nations that knew not thee shall run unto thee because of the Lord thy God, and for the Holy One of Israel; for he hath glorified thee. These verses, especially the one in bold above, have meant a little more to me as of late than they have in the past. They fill my heart with a peace and joy that is hard to explain, but I'll definitely try. 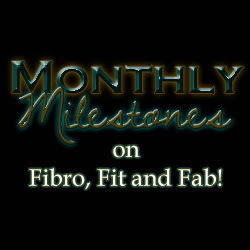 It all started back a few years ago when I was diagnosed with Fibromyalgia. Back then I thought very little about God's plan for my life where illness and suffering were concerned. I thought that Fibro was a bump in the road, and that surely God didn't plan it to be in my life - it just was. I have realized since then that, though God is not the cause of our suffering (that ultimately is caused by sin), He does allow it for reasons that are sometimes only known to Him. How can I say that? Well, my thinking on this began to change drastically back in June. Though I've only alluded to it in my Monthly Milestones posts, my health has been a challenge, especially since June. I've had more sensitivities to foods (IBS is a daily occurrence if I don't watch what I eat), exercise or a lack thereof is affecting my strength and fatigue levels more than ever, and the amount of migraines I've been having has risen exponentially, and they are lasting longer, too. I've had tests for bleeding disorders because I'm bruising easier, I had an ASCUS pap in July (which was of no concern after further looking into it), I've been diagnosed with Fibrocystic Breast Disease or Fibrosis (Hurray for no cancer, but I still have to be diligent to check for new/growing lumps. I have to go back in a year, sooner if I notice something new, but no surgery or biopsies for now. ), and have recently had some issues feeling like I was swallowing around a lump in my throat which I have to keep an eye on (they think it is allergy/illness related and caused by excess phlegm, not thyroid, since it seems to be improving). I've even been having random 99 range temperatures more often than not. I feel very much like a freak of nature, and I have found myself asking God "why?" a lot. You see, I let myself get to the point where I got angry. I found myself looking around at all the healthy people. I found myself looking in the mirror and being upset that I can't lose weight like "normal" people or that I can't seem to get and stay healthy. I was feeling picked on, and I let God know it. I quite simply cried out to Him with, "Really, Lord? Really? But I have plans! I have goals! I want to serve You and take care of my family! Is that so wrong? Why have you left me so helpless?" Oh, yah. I went there. And you know what He whispered back? "I know you have plans...But you never thought to ask about Mine." No, I hadn't thought about God's plans. I couldn't see what His purpose was for allowing me to face such darkness. I didn't see how light could come from trial. Sometimes, I still struggle to see it. Truth be told, it still looks like dark. I feel like a little child alone in a dark room, waiting for the monsters to come out of the closet. Here's the thing that God has been showing me, though. He is showing me that He has chosen me to walk through the dark. He is asking me to take the scary path. I don't know why, but I do know this: The path that I want to go down of good health and service is NOT the path that I think it is. You see, I see the easy path. You know the one. The one with the flowers and no twists and turns. It is well lit and beautiful, and it looks perfect. But, that's just it: It just looks perfect. I can't see that it leads to a drop off that will put me in great danger. I can only see the immediate. It is not the right path for me. God's path for me looks a bit like the things nightmares are made of. It looks like that scary dark room, and I'm that little child who is freaking out looking at all the shadows. I've cried out to God, my Father, and asked Him to turn on the lights, only to find that He is offering a flashlight to illuminate only a little at a time. "See?" He says, "That's not a monster. It's a rocking chair. It's where I will sit and hold you when you cry, need comfort, or when you need some time alone with Me." He shines His light in another dark corner and says, "And that's nothing to fear. It's just a pile of books that will teach you many wonderful things." The lights go out again, and I realize that the shapes in the dark are not what they seem to be. They are things that will be or are sources of comfort and learning. The light, His light, shows us that the things that go bump in the night are not what they appear - they are things for our learning and our joy...if we don't give into the fear. Best yet? God is there with us to hold our hands, just like any good parent would do for a frightened child. And you know what? I am just such a child. I have been frightened of the unknown, I've wanted the lights on, I've wanted the easy and the known, but that's not what God has for me. He has a plan that will be more beautiful, more amazing, and more wonderful than I could ever imagine...If I'm willing to trust Him. So, here is where I am. I am in the dark with a flashlight, holding onto God's hand as tightly as I can. I don't know what's in the dark. 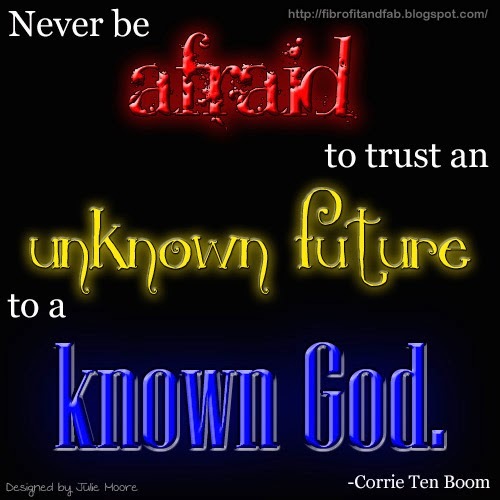 I am admittedly a bit afraid, but God is showing me that He is there, and it is His plan. I will come through it better than I could ever imagine, if I just hold onto Him, even if the results seem scary and bad, they aren't. They are lessons to be learned that can be learned no other way. They are the way to greatness and love that is beyond understanding. 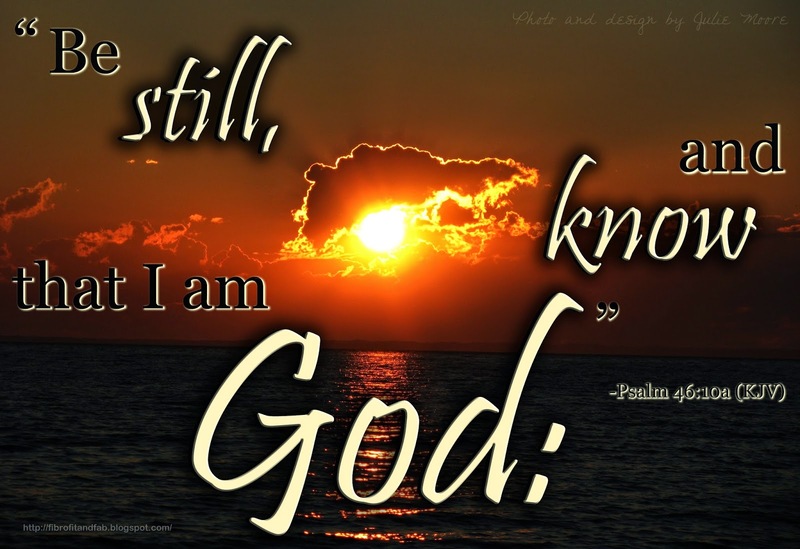 They are His thoughts and His ways...and I trust Him. Please continue to keep me in your prayers. I've gotten very few answers regarding my health, but tests have come back "normal" or "inconclusive", and we just have to wait and see. God has given me some encouraging things to help me along my dark path (like great prayer warrior friends and amazing family), and for that I am grateful. 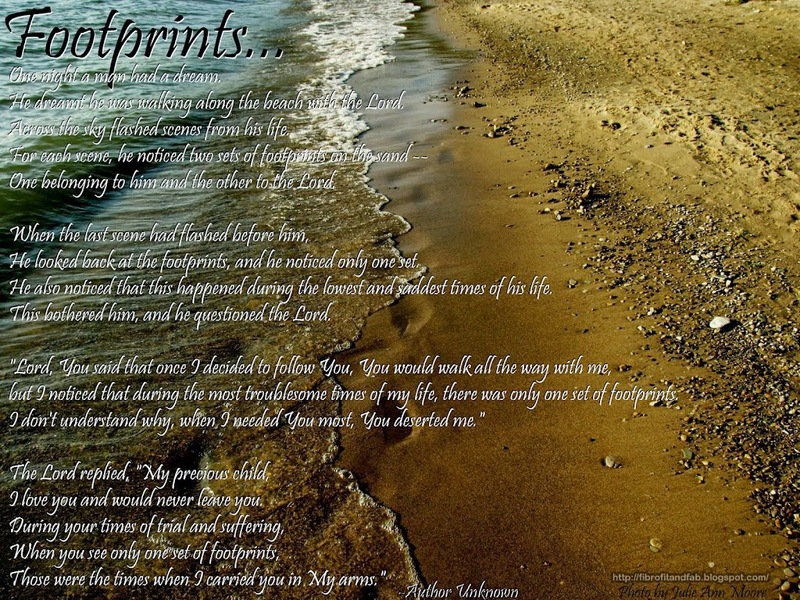 I am humbled that He'd choose me to go through these things, and so very grateful He's with me each step of the way. 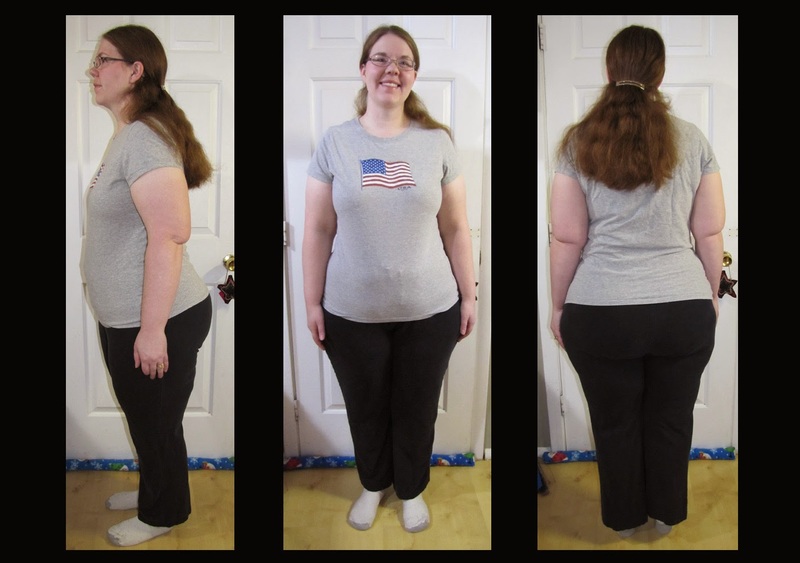 Me as of today, November 1, 1014, at 229.5 lbs. I'm slowly starting some of the changes on my blogs, and not all of them for good reasons. I'm still insanely busy and been dealing with some health issues that I will explain more in the next point, so I haven't gotten to any of the real fun changes that I have planned for here or on Natural and Free. 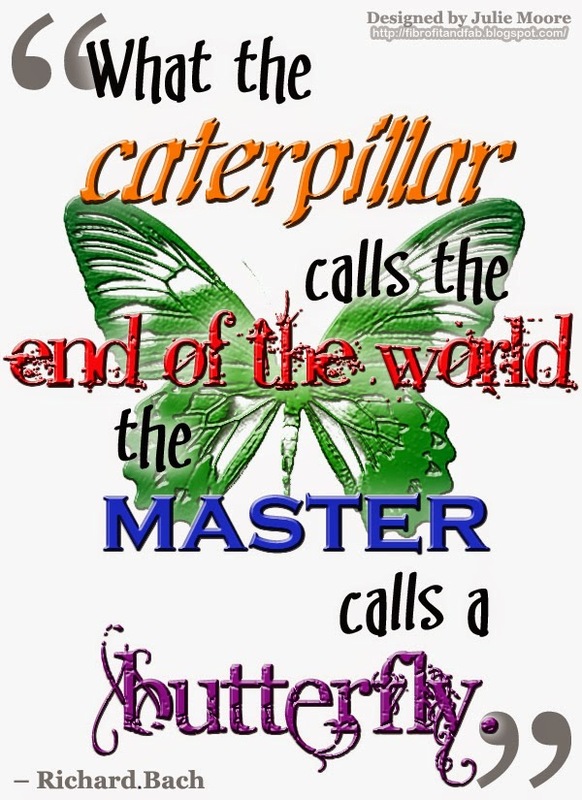 I have, however, found that some people have been taking my free Fibro and inspirational images and modifying them or changing the link to them so that I am not getting the traffic from them or the credit for them. People are even marketing them as their own work. This means that I will be adding a watermark of sorts to them, that I've had to contact some sites about either removing my content or giving me credit, and a few other things. Let me be clear: I want my images to be free to use for personal use, and I want you all to have easy access. However, using my images without giving me credit, editing them without permission and calling them yours is STEALING. Don't do it. If anyone (business, blog, person, or otherwise) wants to modify the images, email me, and I will modify them for you or discuss the terms of you modifying them. I am more than happy to modify images according to my terms and open to suggestions about new ones. I'm going through some medical testing right now. About 3 weeks ago or so, I found a lump in my right breast. I have also developed tenderness and some swelling in my left breast. I had a mammogram on both breasts and ultrasound on the lump in the right breast on Thursday, October 30th, 2014, and hope to get the results from that some time next week. 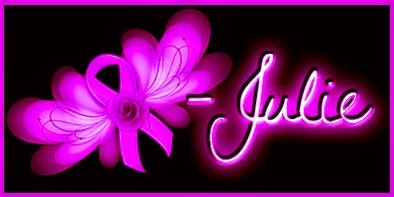 Breast cancers, benign cysts, lumps, etc. run very high in my family, so neither I nor my doctor are taking this lightly. I had a physical 3 1/2 months ago or so and felt no lump or tenderness then (and even as little as a month and a half ago I felt nothing either), so even if this is the "worst case", we feel like we've found it very quickly. Of that I am grateful. Prayers and thoughts appreciated as we wait on results and then decided on next steps. Thank you! I will keep you all posted. 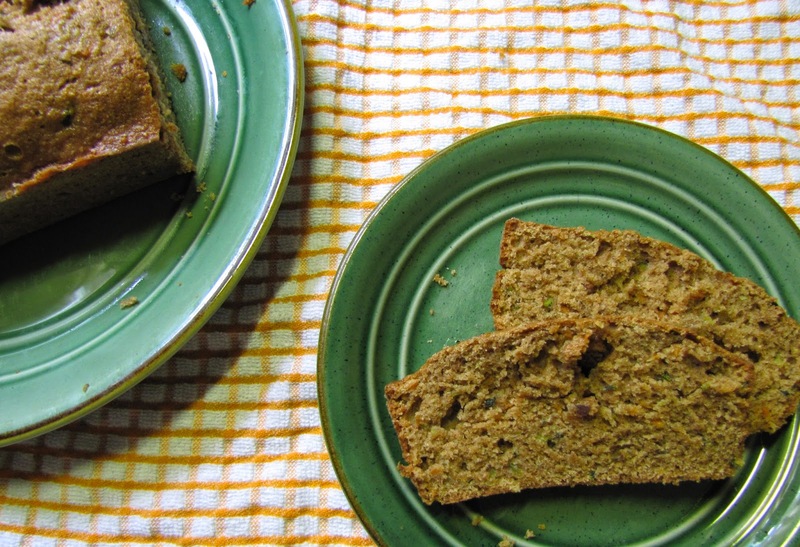 This recipe is a twist on my Zucchini Bread recipe. It reminds me of carrot cake without the frosting, hence the name. I'm sure you could make it in a cake pan and frost it and have a delicious carrot cake, too. 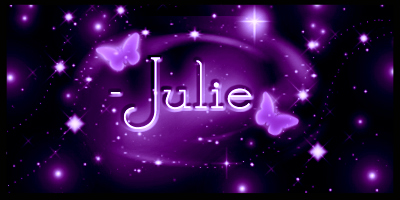 :) I hope you like it! Please note that this recipe is soy-free if you use all soy-free ingredients, and is fish and milk-free. It can also be nut, egg and wheat-free (see variations). 1. Grease and flour two 8x4 pans﻿ (To keep this recipe milk-free and soy-free, use olive oil or lard to grease the pan. If you don't need to keep it milk-free, use full-fat, salted butter.). 2. Preheat the oven to 325oF. 3. Mix flour, salt, baking soda, baking powder and cinnamon together in a medium bowl; set aside. 4. In another large bowl, beat eggs, oil, applesauce, sugar and vanilla until well blended. 5. Add dry ingredients to the creamed sugar mixture and beat well. 7. Stir in the pecan pieces (amount is based on personal preference) until evenly distributed. 8. Pour batter into prepared pans and bake for 55 - 70 minutes or until tester/toothpick inserted into the center comes out clean. 9. Cool loaves in pans on wire rack for 20 minutes before removing the bread from the pans. 10. Allow the bread to cool completely on the wire rack before enjoying. Nut-Free: Leave out the pecans and prepare as directed. Egg-Free: Use an egg replacer or try one of the ingredient substitution ideas for eggs listed here. Wheat/Gluten-Free: Use a gluten-free or baking mix of your choice for the flour. You can even use gluten-free flour/baking mix to flour the pans with. Note that this substitution will change the texture of the bread (no matter what kind you use), and may require 3/4 to 1 teaspoon of xanthan gum or ground flaxseed for textural purposes. Stir-In Ideas/Substitutes: Use walnuts, dried cranberries, pumpkin seeds, raisins, apple, crushed pineapple, chocolate chips (Enjoy Life is a great allergy-friendly option), etc. for the pecans or along with them. I would not recommend using more than 1 Cup total add-ins, so make sure that the amount of pecans, raisins, pumpkin seeds, etc. does not exceed 1 Cup total. Also, if you use crushed pineapple, you will not want to use more than 1/2 Cup and may want to leave out the applesauce. Make sure you drain the pineapple well, as it will increase the moisture content by a lot. If you want to use both applesauce and pineapple, reduce the applesauce to 1/4 Cup and use 1/4 Cup crushed pineapple. 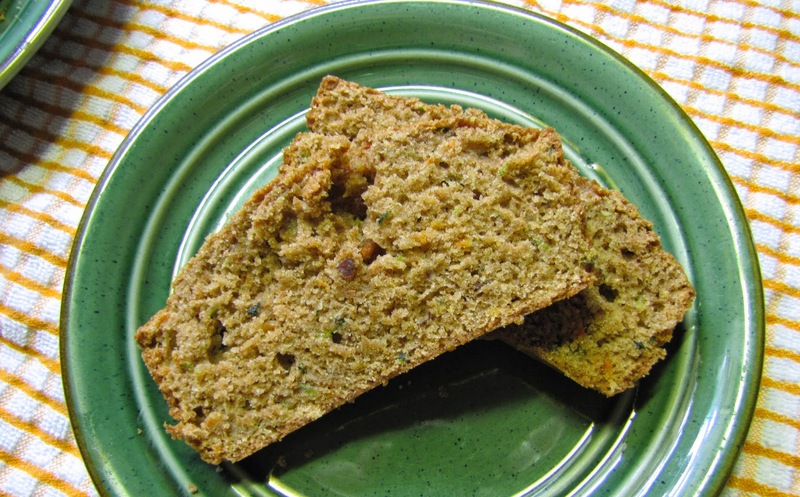 Less Zucchini Bread: If you don't want so much zucchini, you can reduce the zucchini to 1 Cup. You do not have to increase the amount of carrot if you do this. 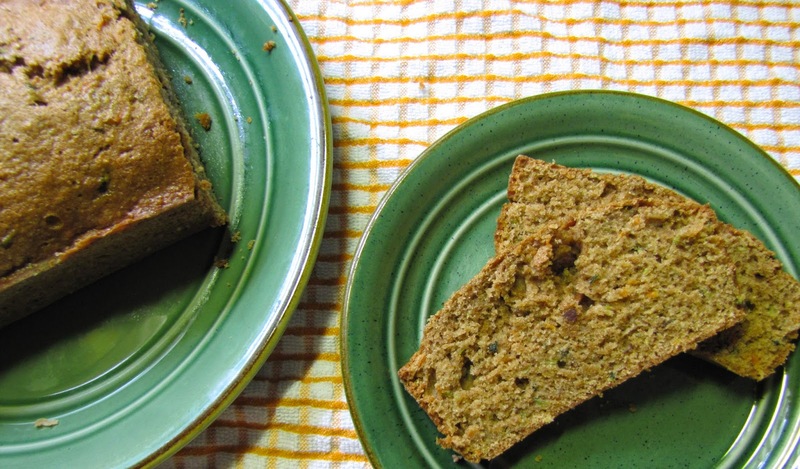 Carrot Cake: Bake this recipe in a 13x9 pan instead of loaf pans and cook at 325oF for 40-45 minutes or until a tester/toothpick inserted into the center comes out clean. Top with Sweetened Whipped Cream or frost with Vanilla Buttercream or the Cream Cheese Frosting Listed below if desired. You can also top it with chopped walnuts or pecans if desired. Note: You can try your hand at making a soy-free version of cream cheese from scratch if you like (I've not tried it, so I can't vouch for the taste, though.). You can also try using a dairy-free, soy-free "butter" (Earth Balance has one) if you want to make the buttercream dairy and soy-free. There is a recipe for a dairy and soy-free "cream cheese" frosting here, but I've never tried it, so I cannot vouch for the taste. You can also just dust the cake with powdered sugar or eat it plain as well. 1. Cream butter and cream cheese in a medium bowl until creamy. 2. Mix in vanilla and salt until well blended. 3. Gradually stir in the powdered sugar until well incorporated. 4. Store in the refrigerator until ready to use. Chocolate Cream Cheese Frosting: Stir in 1/4 to 1/2 Cup cocoa powder with the powdered sugar. Looks good, right? I promise; it is! Do you like sweet or savory breads better? Me on October 5, 2014 at 230 lbs. My system is getting more and more sensitive to certain foods. Here's what I know: garlic in any form, raw onion, corn products of any type, too many grains, too much processed sugar (honey is fast becoming my go-to sweetener), soy in any form, too much pre-made foods or highly processed foods, or too many foods that are fried or considered junk are BAD. My body is letting me know very quickly that I cannot eat these things. I get IBS-type symptoms, migraines, pain or all of the above. Not worth it. Sometimes, eating out or having limited choices happens, and I have to pick the lesser of the evils, but I have a feeling that there will come a point where I cannot do this. I have a very short list of things I can eat when dining out, and if I stray from it, it is a bad day. I hope the list doesn't get too much shorter, but it just might. We shall see! I've been in a fair amount of pain for weeks now. Between migraines, IBS-symptoms and body aches or stiffness, I've had a really hard time pain-wise. Part of it is the stormy weather. Part of it is this new extra sensitivity to foods. Part of it is doing too much and feeling overwhelmed. It has caused a whirlwind of emotion for me, especially frustration. I just want to function normally, and I don't. When I hurt, the Fibro Fog is worse, the emotions go into hyper drive, and the world spins out of control. There is a grieving process involved with that. I grieve the loss of me. I know that at times like this, I need to be in the Bible more and praying more, and it does help. I don't know why God has chosen this valley for me, but He has, and He walks through it with me. Just pray I don't lose sight of that. :) Thanks! Awhile ago, I was sent an email regarding a Fibromyalgia infographic*, and I am just now getting the time to share it with you (Thanks for sending it my way, Skylar!). If you follow this link, you can find a way to share it on your blog, Facebook page, etc., if you wish. You can also find some more information there on Fibromyalgia, as well. Fellow Fibro sufferers, what information would you want added to this infographic if a revision was to be made in future? What questions do you think this doesn't answer that would be helpful to have answers to? *I was not paid or otherwise compensated to share this infographic, nor do I work for nor necessarily agree with everything done by or come up with from MBA-Healthcare-Management.com or their associates. I am only sharing this infographic because I thought it would be of benefit to you, my readers. 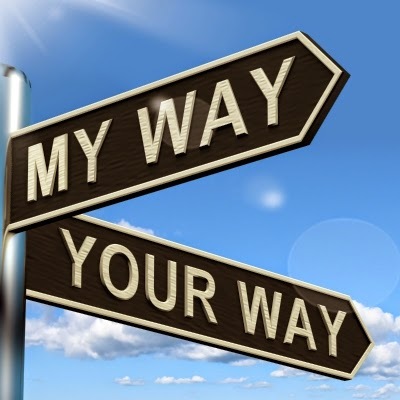 Your decision to share it is your own and will not result in me or yourself receiving any sort of benefits, pay, or other form of compensation from MBA-Healthcare-Management.com or their associates. 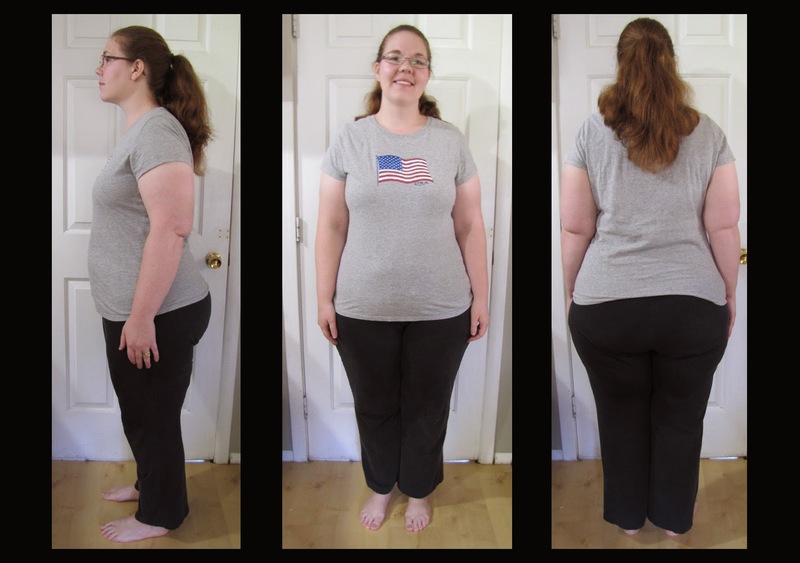 Me as of today, September 6, 2014, at 230 lbs. Hubby and I are still walking almost daily! We normally walk for at least 15 minutes, closer to an hour if we can manage, sometimes even longer. We walk whenever we can. The only time we don't is when it is raining too hard to do so. I'm not sure what we'll do when it starts snowing, but I plan on walking as long as the windchill is in a safe range and it isn't blizzarding outside. I truly feel awful when I can't walk, so I know that will help motivate me to keep it up even when it is cold outside. I'm still working on what I can and can't eat. The only thing new I've cemented for sure is that grains in more than one or 2 servings (and generally it is more than 1) a day for me = weight gain. I have also found I have to avoid corn most of the time. I can enjoy carbs, but I have to be VERY selective about which ones. I can eat fruit and honey more often than say limited ingredient chips, pretzels, pasta or bread and cane sugar, too. I try to keep myself focused on protein and veggies, though. Also, processed/pre-made/fast foods are pretty much a no-go unless I'm very picky about brands, amounts, etc. It's not easy for me to follow all of these "rules", but if I stray too much from them, I have stomach issues, headaches, weight gain, etc. so hopefully that will motivate me enough to stay away. Overall, I'm figuring out what works for me and what doesn't. School is back in full swing and going quite well! 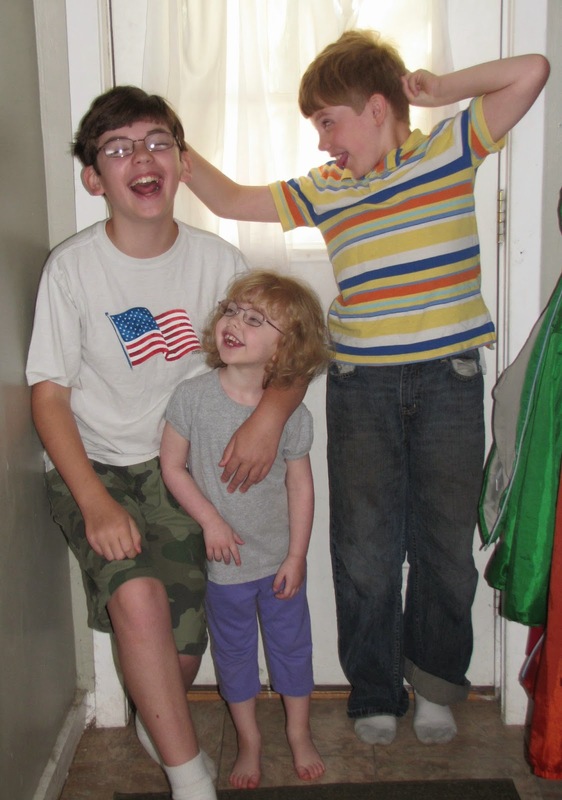 Our first week of homeschool via online school is done, and went very well! My Sean got 100% on his first spelling test, which is completely awesome, and doing well overall, and Stephen is doing amazingly with his coursework, too. I'm so proud of them! Elaina is due to start preschool in a few weeks, and is beyond excited! She won't be having the teacher we expected (which totally bums me out), but we have every hope that she will have an amazing teacher. :) We shall see! Oh, and I've even got to Admin some groups for my boys' school on Facebook, so that's been exciting! It's a way for me to help other Learning Coaches (LCs) and students when it comes to schooling stuff, and that's right up my alley. :) All in all, I'd say back-to-school is off to a chaotic, but good start! 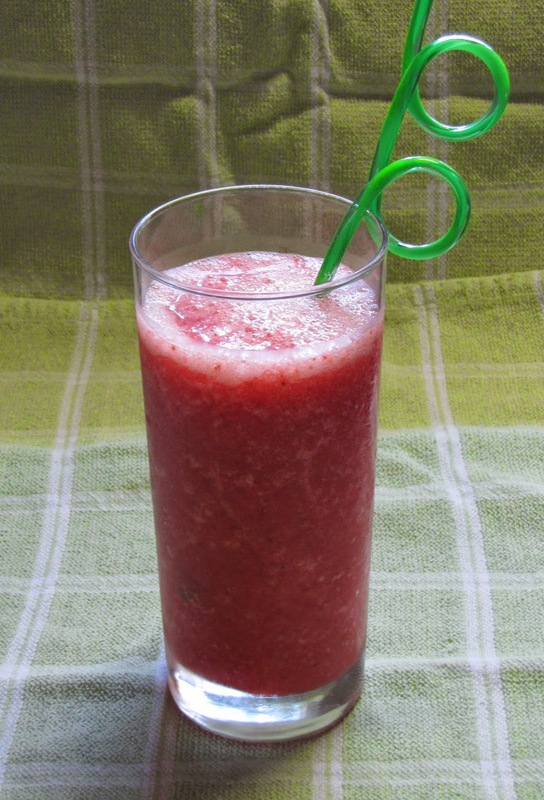 Place desired amount (about a cup per person generally) frozen (yes, they MUST be frozen) strawberries﻿ into a blender. And that's it! Easy peasy lemon squeezy! :) Just pour into a glass or glasses and enjoy! Diabetic Friendly: You can substitute a sugar-free lemonade and sugar substitute as needed for the lemonade and sugar in this recipe. Alternate Sugars: You can use a lemonade made with honey, maple syrup or some other natural sweetener, too, if you like instead of the lemonade listed and use honey, maple syrup or some other natural sweetener as needed for the sugar, as well. Other Fruits: You can use any frozen fruit or berry that you like in place of the strawberries, such as raspberries, cherries, blueberries, mango, pineapple, etc. You can use any mix of fruits and/or berries that you like, too. If you want to use a fruit like watermelon that doesn't freeze well, just freeze the lemonade into ice cubes instead. You will have to use the lemonade ice cubes, fruit and some liquid lemonade (and sugar, if needed) if using this option. Other Liquid: If you want, you can always use another liquid. 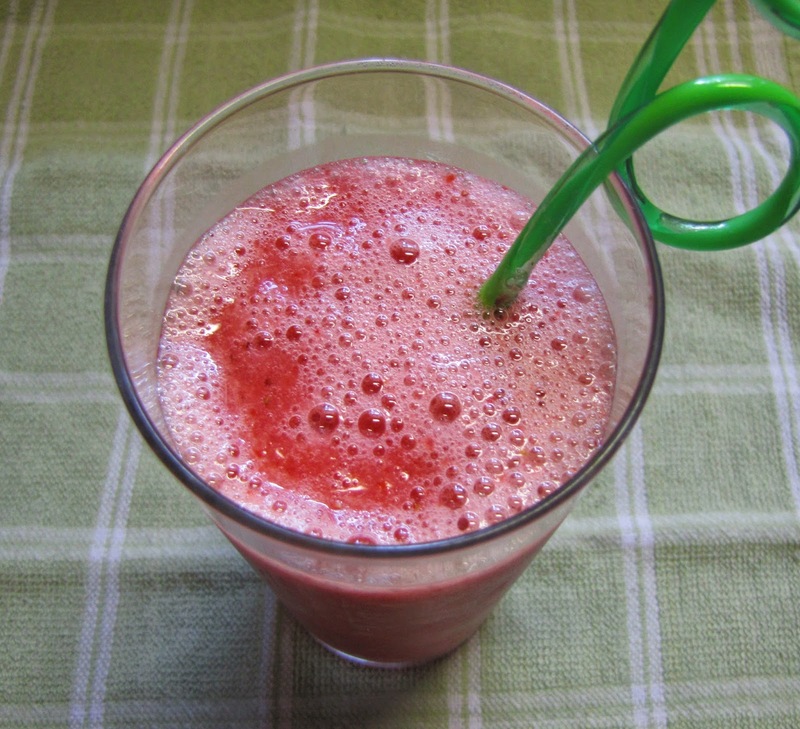 You can use any juice or combination that you like (see my Fruit Smoothie recipe). 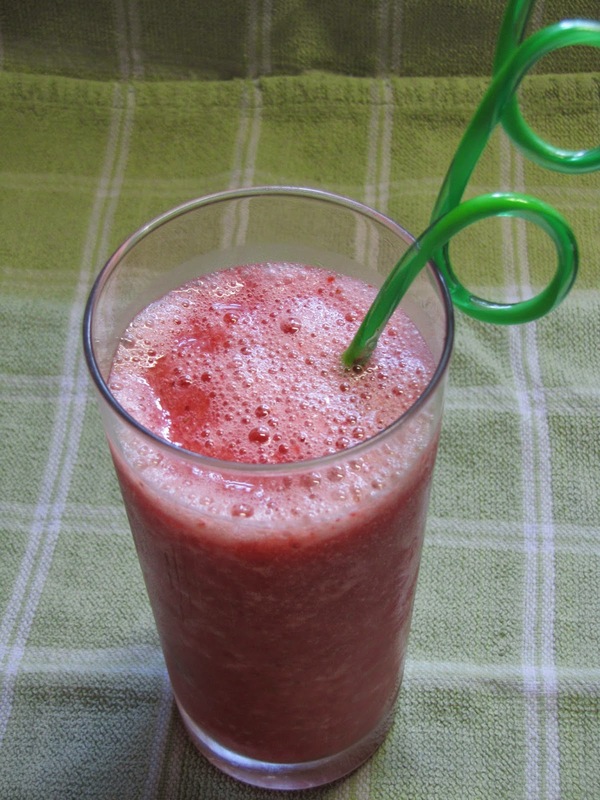 You can also blend a juice like orange, limeade or pineapple with the lemonade, if desired. 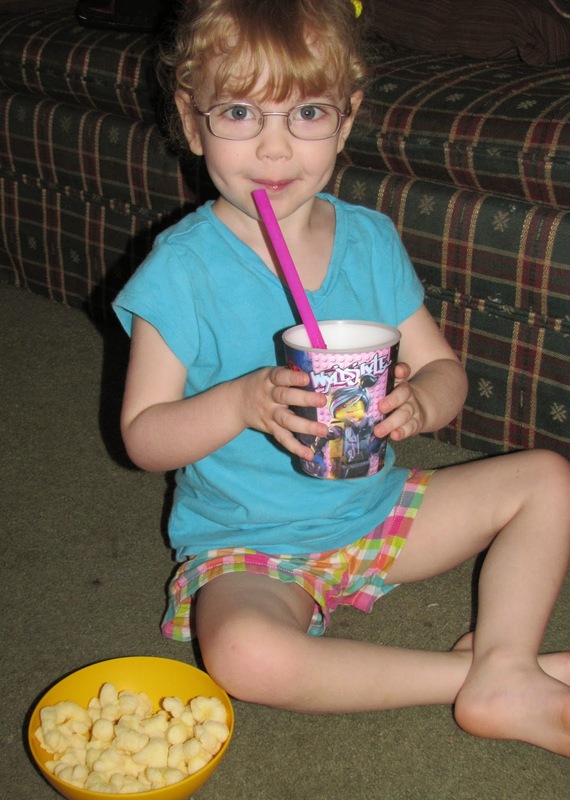 What's your favorite summer time, family friendly drink of choice? 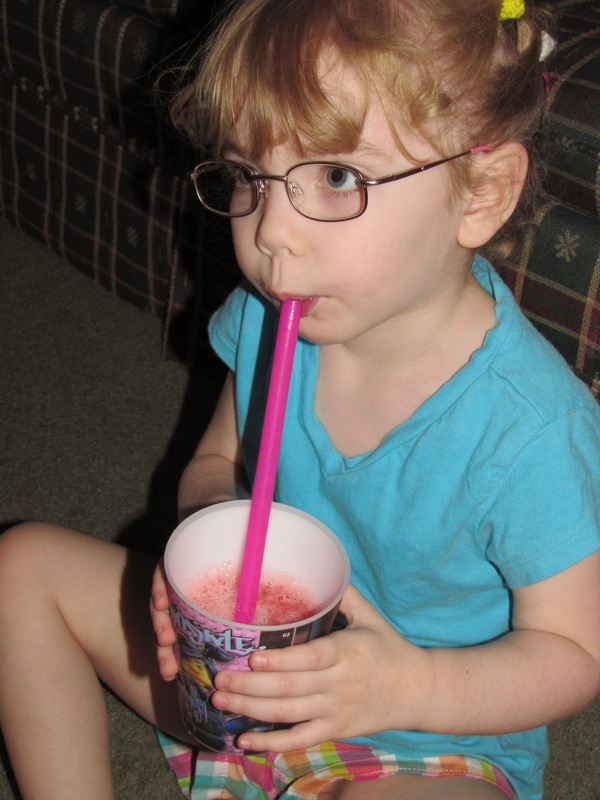 What's your favorite way to cool off on a hot day? What's your favorite lemonade flavor or smoothie flavor? 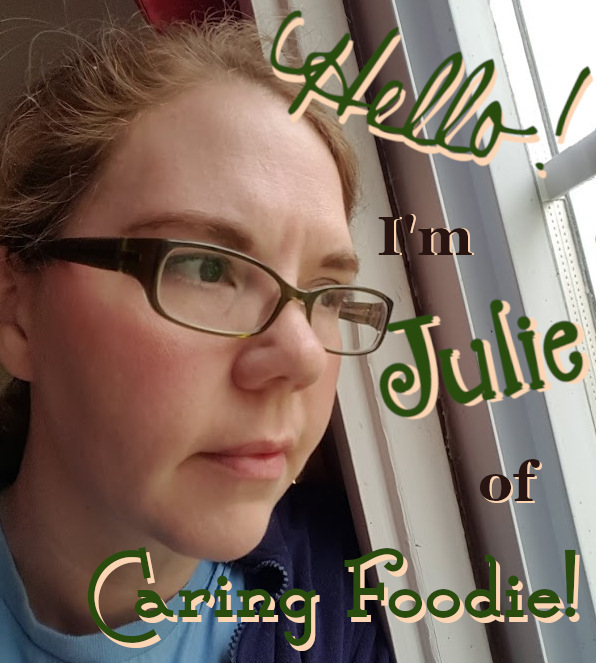 All the photos and text contained in this blog (unless otherwise indicated) belong to me, Julie Moore of Caring Foodie (formally of Natural and Free and Fibro, Fit and Fab!). You may ONLY share photos from this blog as long as you have WRITTEN PERMISSION (via email) and you agree to link back to their original posts and use them for the sole purpose of featuring my work. Please do NOT borrow, alter or sell the pictures to sell your own goods. If you do link to my posts, please let me know so that I can check it out. This site also contains links to outside sources that are not associated or affiliated with me or my blog, Caring Foodie. I do not necessarily agree with or condone all information available at those sources, and I am not responsible for the content they post or any issues you may have when visiting their pages/sites. All links were valid and safe at the time I shared them. If they are no longer valid or safe, please let me know, and I will remove or change them as needed. Information about your use of this site is shared with Google. ALL CONTENT COPYRIGHT 2012-2019 by Julie Moore of Caring Foodie. Awesome Inc. theme. Powered by Blogger.